Sometimes the backdrop of a wedding is just as important as the people gathered for the celebration. Especially if that location has a personal significance. Seely Stephenson and Bo Nicholson tied the knot in Roaring Gap, North Carolina this past September. The bride’s grandparents were married in the same spot many years ago. In fact, they were gifted with a painting of the wedding site, the Greystone Inn, for their wedding. Seely wanted to incorporate that piece of family history into her paper trousseau. The painting was used as the building block for the Save the Date design. The information was kept minimal and the colorful painting set the stage for the wonderful weekend in the mountains. The wedding invitations, printed by our friends at Arzberger, also incorporated the same image, but we softened the edges of the painting. The deep green ink stands out beautifully on the crisp white paper. 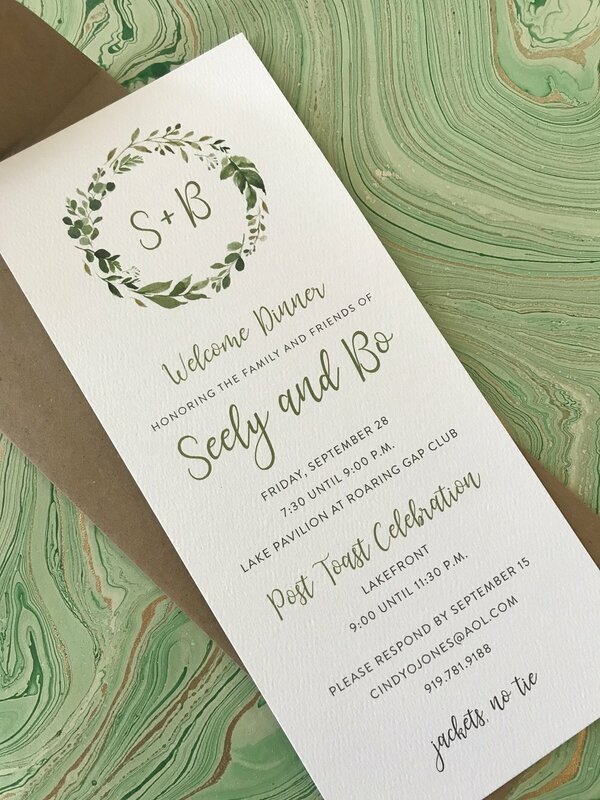 Using the same fonts from the Save the Dates helped create a cohesive feel for the wedding. These invitations had two press runs, one for the digital image at the top, and a second for the raised text. 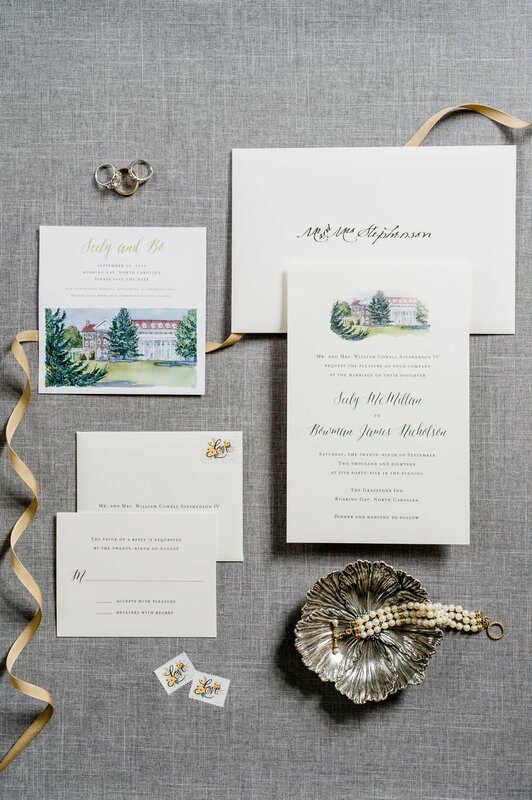 While the Welcome Dinner Invitations echoed the mountains with the kraft colored envelopes and motif of greenery, the personalized coral napkins gave a pop of color. Seely and Bo’s fun-loving personalities shined throughout the weekend. And that joyous spirit was included in all of the wedding details. They built new memories on the shoulders of cherished family ones. How lucky are we to be a part of it all?